A few weeks ago we went on holiday to London and Glasgow, and as luck would have it was in London for the first two days of London Fashion Week. I managed to attend one show, which I'll write about in another post. For now, I'll talk about the Punk Glam Princess and my adventures. Our first night in Glasgow was spent having a gabfest at the hotel, which I wanted to go on forever! The Queens are the best and lavished us with such thoughtful and yummy gifts! Day two we met up with Queen Michelle and she took the PGP and I around shopping. My favourite shop was the lingerie shop Boudiche, where I purchased the most beautiful pair of Bebaroque "Myrtle" tights. Back in the '80's I designed lingerie and I still have quite a weakness for it, and Boudiche was a scrumptious sight to behold. The staff was so sweet, offering tea, and helping when needed. They also told me that when you order from the US via their website, the VAT is automatically deducted, and the shipping charges are quite reasonable. I know there will be more shopping from them in my future -- I had my eyes on some beautiful Bebaroque stay-ups and tights that were sadly out of stock but should be in soon and I will definitely be ordering from them. Queen Michelle tried on a gorgeous Lascivious Candy bodysuit from their Showgirls collection in hot pink that made us think of super heroes, so a super hero shot was in order! It was sad to say goodbye, but hopefully it won't be for too long! Back in London, the scramble started. I was taking the PGP down to Brighton to stay with her bestie L-Belle, and my bestie Barbara. We also decided to get haircuts at Rush since the last experience was so great. The lovely Esther (see my post from last summer here) wasn't in that day, but Brooke was suggested. So the PGP got her very first salon cut and I must say it looks gorgeous! I also got a fabulous cut, so here's another recommendation for Rush in Brighton -- different stylist, still a great cut! I left back for London solo as the next day was the first day of LFW. The lovely Brooke at Rush, Brighton. The Punk Glam Princess with her new 'do and L-Belle. My new 'do much later that evening after rain! It actually looks much better, or will do once my hand is fully working again! There was a total mess-up with my invites, I was assured they had been sent to the hotel, yet nothing arrived. The concierge even checked with the other hotel with "Bloomsbury" in its name as he said sometimes things go there by mistake. But no luck, it still remains a mystery. Thankfully a very magical pixie (you know who you are!) was able to make a mad scramble to get me on the list for the Felder+Felder, Jean-Pierre Braganza, and Hannah Miller show. I'm so grateful as I really enjoyed the show, which will I'll also feature in another post. I must also suggest The Bloomsbury Hotel on Great Russell Street (very close to the British Museum and Oxford Street as well). The hotel has had a total renovation and was preciously a Jury's hotel. Its now stunning as well as accommodating. We'll definitely stay there again. The PGP at the entrance to our lovely room at the Bloomsbury Hotel. Our room at the Bloomsbury Hotel which was quite spacious although it doesn't look so in this photo! I love staying in Bloomsbury as its so convenient for me to get to other parts of London. For example, the tubes were a mess while we were there, and on our last night we were headed to the Angel to meet up with some friends at our fav restaurant S & M Cafe (mind out of the gutter, Sausage and Mash, great traditional British food) but realized the tube would have stopped far below. However, just around the corner from the hotel there were loads of buses on New Oxford St. that took us directly there. Wandering home after a meal at the Stockpot in the West End, we came across this at Centre Point. What sort of fancy sports car was this? A Smart car! Pretty snazzy, no? On the second day of LFW I decided to get some shopping done. 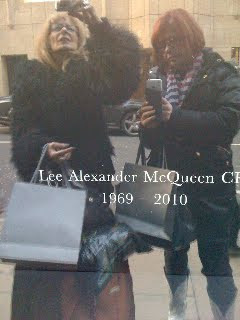 I had to meet up with Barbara who was bringing the PGP back to London, and we decided we needed to go to the Alexander McQueen store. As mentioned previously, the scene was somber as was to be expected. I Love my new sunglasses but was a little disappointed that the boots and ring I wanted were out of stock in my size. (No matter, I remedied that once in NY, post foreshadowing heehee!) 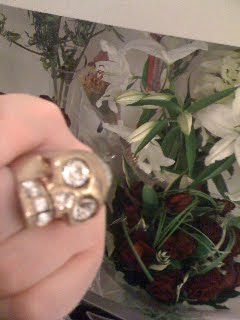 Barbara got a lovely ring as well. Barbara's new ring by the condolence book and flowers inside the shop. Photo by Barbara Taylor. Barbara and I reflected in the window, trying to take a photo of the tribute. Photo by Barbara Taylor. I loved this photo of Alexander McQueen. Sorry for the long-winded post, but I had to work on it piecemeal and it turned out a bit longer than planned! I still have posts coming, so as my hand slowly heals they'll be coming along so stay tuned for more! Its really so beautiful pictures. thanks for sharing us. Wendy, next time we go together! Ashley, Thanks, I'm glad you enjoyed!